Part of what's difficult about decision making is that it forces you to take a stand. Taking a stand means raising your profile to the point where people can hold you accountable. What if you did what you thought was right, but you ended up being wrong? Do you stick with your decision, or change course? This is the particular melancholy that comes with making decisions, and it is a primary concern of director Wong Kar-wai in The Grandmaster. Please note that the following review is based on the North American cut of the film rather than the longer domestic Chinese and “international” versions. 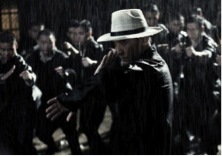 The Grandmaster is set in the early 20th century in southern China (mostly Foshan and Hong Kong), circling around the lives of individuals in the martial arts world. The practitioners from the north are led by their Grandmaster, the aging Gong Yutian, who has successfully brought together competing martial arts schools and now wants to oversee a smooth merger with the schools in the south, anticipating his own retirement from leadership. To this end, Grandmaster Gong asks the southern schools to pick a representative to challenge him to a match; his secret hope being that a challenger would unify both the northern and southern schools together. The southern schools select Ip Man (played by Tony Leung). The result of their duel (which is more understated than one would expect) triggers decisions from Grandmaster Gong, Ip Man, the Grandmaster’s daughter, Gong Er (played by Zhang Ziyi), and Ma San, who is the Grandmaster’s oldest disciple. Each of these people desire something different, and the movie plays out based on the ramifications of those individual decisions, and the regret that they feel afterwards. The characters all live by a code derived from their shared discipline of martial arts, but the differences come in how each of them interpret what that code means. Sometimes the people who are most dedicated to a code or a certain lifestyle still experience doubts or look back to wonder upon missed opportunities, and Wong Kar-wai dwells, as he tends to do, in these more ambiguous places of the heart; it is a movie built on an atmosphere filled with smoky rooms, steady gazes, grainy sepia (which didn’t always work for me, admittedly), and nattily dressed people in suits and furs throwing punches and kicks. Everything prim and proper on the outside to hide the turmoil inside. Wong juxtaposes these understated and conflicted characters with carefully composed shots of a China which is changing rapidly because of political events; for both the characters and their country, time is slipping away, and change is coming whether it’s wanted or not. The action sequences are of a piece with the rest of the movie, outwardly pleasing but containing a deeper and far more interesting subtext. Yuen Woo Ping makes the most out of the practical effects, with a modest seasoning of wirework, but the choreography here is more focused on the symbolism of each martial artist’s particular style rather than the force of punches, broken bones, or bloody knuckles. There is lots of dialogue about the philosophies embedded in each style of kung-fu, whether it’s Ip Man’s wing chun or Gong Er’s “64 Hands,” but it’s all a collection of clunky adages of Hallmark-level sentimentality until the artists manifest what they believe in their heart and minds through their hands and feet. The subtext and the contrast in styles makes the duel between Ip Man and Gong Er in the middle of the film particularly intriguing; I’ll come back to this duel in future viewings not for the force of the blows or the spectacular acrobatics, but the tension that starts between these two which turns into something different. Zhang Ziyi is noteworthy for her standout performance. I’d speculate that most Western audiences still remember her in roles marked by a girly, coltish energy, which makes sense since she was in her early 20s when she was making Crouching Tiger, Hidden Dragon and Rush Hour 2 and Hero. She’s 34 now, far removed from playing petulant adolescence, or wide-eyed naivete, and her age suits the more mature character of Gong Er, a strong woman who is resigned to bearing her wounds gracefully, rather than as excuses to lash out at the world. There has been much made of The Weinstein Company’s decision to distribute a cut (although with Wong Kar-wai’s approval and supervision) that is a whopping 22 minutes shorter than the original domestic Chinese version. Since North American audiences have little to no idea about Chinese historical figures or context, the studio felt the need to re-sequence some scenes and add explanatory voiceovers and titles. This makes sense, and is a defensible choice. Unfortunately, I think the main criticism of this movie would be that it feels disjointed, and that seems to be at least in part related to the new cut. The North American cut, as it is, uses some patchy transitions to get to the next scene and it took me out of the movie’s rhythm. I would gently submit, as a fan of foreign films, that anyone going to see The Grandmaster could probably figure out who the characters are without the level of handholding the voiceovers and titles imply is needed. The studio is clearly aiming for as large of an audience as possible, but I’m unsure of how much broad appeal an atmospheric period movie, even with kung-fu, would have. That said, I sincerely hope that this movie finds an audience, if only for comparing this one to the potentially better version that could be out there, but also for enjoying a movie from a gifted director meditating on one of his primary concerns. Great review Mark! I'm looking forward to seeing the movie, although, robbing Zhang Ziyi of her girly coltish energy is like telling a Rabbi he can't reference the Torah. Thanks Adam. Let me know what you think once you see it. As for Zhang Ziyi's coltishness, not every movie can be RUSH HOUR. That sounds like a great movie. I think ill try to watch the Chinese version to get the full story. Can you review IP Man? I would love to hear your take on it. Looking back at it, I think the review comes off more positive than I felt about the movie when I watched it, which was a little bit of a frustrating experience (the titles were getting harder to ignore). Spending a lot of time thinking about it made me come around to it more, which is probably a good thing about the movie. Definitely would love to hear your thoughts about whichever cut you end up seeing. I've got IP MAN on a shortlist for columns, along with a few other Donnie Yen titles. Spoiler: I like IP MAN. I don't really like IP MAN 2. Thanks for the suggestion! 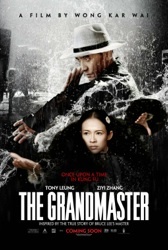 Definitely try to watch the Chinese version of Grandmaster. I saw the U.S release last week and have to say it was fairly butchered. Still an o.k film not nearly as good as the original cut. Here is a link to an article that provides a pretty comprehensive list of changes made to film.